UPDATE (2/1/16): Giya Kancheli's Nu.Mu.Zu has been returned to the archive, but we hope to eventually release this poignant work through our in-house record label, Seattle Symphony Media. Thank you to everyone who listened to the recording! In response to recent world events, the Seattle Symphony has released Giya Kancheli’s emotional new work, Nu.Mu.Zu for Orchestra, for free streaming and download. The work conveys the composer’s struggle with comprehending violence and his hopes for a better future. Conducted by the Seattle Symphony’s French Music Director, Ludovic Morlot, Nu.Mu.Zu was recorded live at its U.S. premiere a week before the events in Paris and Beirut. Click here to read Seattle Symphony Annotator Paul Schiavo’s program notes on Nu.Mu.Zu for Orchestra. 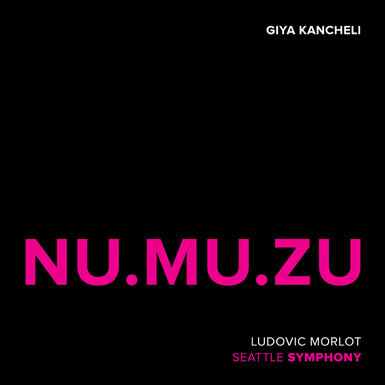 The Seattle Symphony’s performances of Giya Kancheli’s Nu.Mu.Zu for Orchestra, conducted by Music Director Ludovic Morlot, were recorded live during the November 5, 6 and 7, 2015, performances in the S. Mark Taper Foundation Auditorium in Benaroya Hall. It was edited and produced by Grammy Award-winning producer and engineer Dmitriy Lipay, in consultation with the composer. Nu.Mu.Zu was co-commissioned by the Seattle Symphony and the National Orchestra of Belgium. The world premiere took place in Brussels in October 2015 under Andrey Boreyko. Nu.Mu.Zu is published by Sikorski Music Publishers. This recording is being released for free streaming and download on the Seattle Symphony Media label, through SoundCloud. The release of Nu.Mu.Zu for Orchestra is made possible through the generosity of Martin Selig. Recorded live in the S. Mark Taper Foundation Auditorium, Benaroya Hall, Seattle, Washington on November 5, 6 and 7, 2015. The performances of Nu.Mu.Zu for Orchestra were presented as part of the Delta Air Lines Masterworks Season. Giya Kancheli Nu.Mu.Zu for Orchestra – © 2015 Sikorski Music Publishers. For more information about Seattle Symphony recordings click here.